In today's busy world, many people are seeking a source of inner peace and tranquility. They are also looking for a way to stay fit, develop balance and combat the effects of chronic diseases or debilitating diseases such as hypertension, insomnia, diabetes and arthritis. While some can achieve results by working out regularly at a gym, for many, especially older adults, that hard, intensive training environment is not for them. The answer to this dilemma can be found in Tai Chi classes. Tai Chi is a centuries old Chinese art developed originally as a fighting art, but refined as a health and fitness regimen. It is soft, gentle, refreshing and fun. In parks throughout China every morning 250 million people start the day doing Tai Chi. The youthful energy of these seniorand middle-aged adults is inspiring. The movements are done ever so slowly. The practitioner becomes aware of every subtle shift of balance and the principles behind the movements. The Chinese believe that Tai Chi promotes health by improving and regulating the flow of Chi (life energy force) from its gathering place in the center of the body (the tan tien) and outward through the body. Western and eastern doctors agree that Tai Chi’s slow rhythmic movements calm the mind, while the body is gently stimulated. Studies throughout the world, have shown Tai Chi to have a remarkable curative effect on such chronic diseases as hypertension, insomnia, lower back pain, ulcers and cardiac disorders. The effects of debilitating diseases such as asthma, diabetes, arthritis and multiple sclerosis have been reduced with many patients leading fuller lives. In addition, it is a great workout! Therefore, there is no need for prospective students to 'get in shape first'. There is no impact, and although the practitioner should never get out of breath, it really works a wide range of muscles, enhancing flexibility and strength. In fact, many arthritis and M.S. patients are encouraged by their doctors to take Tai Chi. The student controls the workout by their stance height. However, anyone with serious medical problems should consult their doctor first for approval. Also, Tai Chi practitioners begin to see results in a relatively short amount of time. Though it usually take 3 to 6 months just to get a basic understanding and learn basic sets of movements and do them with any degree of confidence or proficiency, almost everyone can do the Temple Exercises and the 12-movement form after 1 to 2 months of class. With 2 days of class per week plus an additional 15 or 20 minutes of daily home practice students will achieve a good level of proficiency in the art within one year. 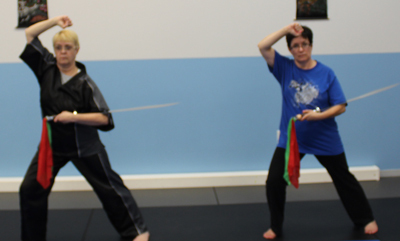 Many people assume that the focus of all martial arts training is self-defense. It should be noted that self deense is not the primary focus of Tai Chi training, though we do teach applications of movements at the intermediate level. These two-person training routines ('push hands') are basically used to teach students correct form and performance of technique not self defense applications.